At exactly fifteen minutes past eight in the morning, on August 6, 1945, Japanese time, at the moment when the atomic bomb flashed above Hiroshima, Miss Toshiko Sasaki, a clerk in the personnel department of the East Asia Tin Works, had just sat down at her place in the plant office and was turning her head to speak to the girl at the next desk. At that same moment, Dr. Masakazu Fujii was settling down cross-legged to read the Osaka Asahi on the porch of his private hospital, overhanging one of the seven deltaic rivers which divide Hiroshima; Mrs. Hatsuyo Nakamura, a tailor’s widow, stood by the window of her kitchen, watching a neighbor tearing down his house because it lay in the path of an air-raid-defense fire lane; Father Wilhelm Kleinsorge, a German priest of the Society of Jesus, reclined in his underwear on a cot on the top floor of his order’s three-story mission house, reading a Jesuit magazine,Stimmen der Zeit; Dr. Terufumi Sasaki, a young member of the surgical staff of the city’s large, modern Red Cross Hospital, walked along one of the hospital corridors with a blood specimen for a Wassermann test in his hand; and the Reverend Mr. Kiyoshi Tanimoto, pastor of the Hiroshima Methodist Church, paused at the door of a rich man’s house in Koi, the city’s western suburb, and prepared to unload a handcart full of things he had evacuated from town in fear of the massive B-29 raid which everyone expected Hiroshima to suffer. 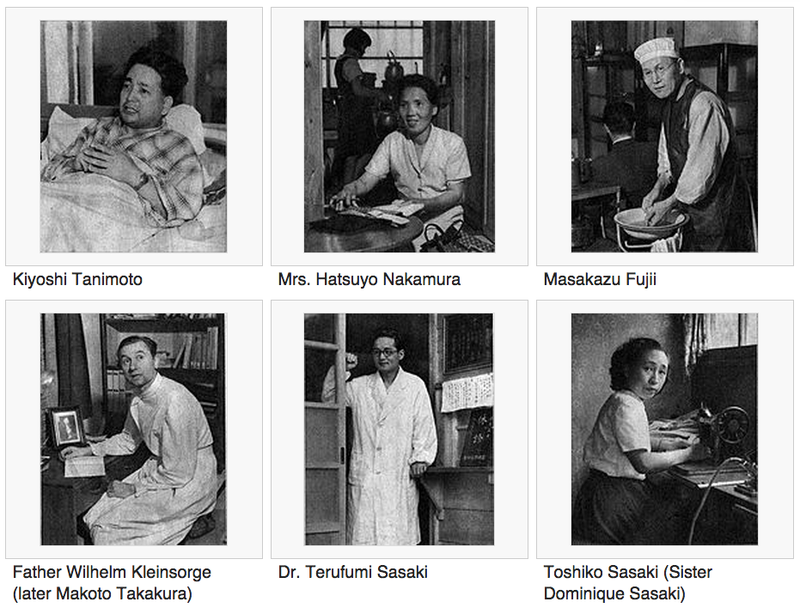 A hundred thousand people were killed by the atomic bomb, and these six were among the survivors. They still wonder why they lived when so many others died. Each of them counts many small items of chance or volition—a step taken in time, a decision to go indoors, catching one streetcar instead of the next—that spared him. And now each knows that in the act of survival he lived a dozen lives and saw more death than he ever thought he would see. At the time, none of them knew anything. Read the piece in its entirety at The New Yorker. Contact the author at rtgonzalez@io9.com. Top photographs via Wikimedia Commons.